Your excellences’, colleagues, friends, and child representatives, on behalf of the HM government of the United Kingdom and the WePROTECT Global Alliance to End Child Sexual Exploitation Online, I would like to thank the governments of Mexico, Indonesia, Sweden and Tanzania for hosting this event today and for their unwavering commitment to protecting vulnerable children from violence and harm. There are times in life when we are faced with brutal realities and how we act as a global community defines our humanity. This is one of those times and the task before represents an enormous responsibility. 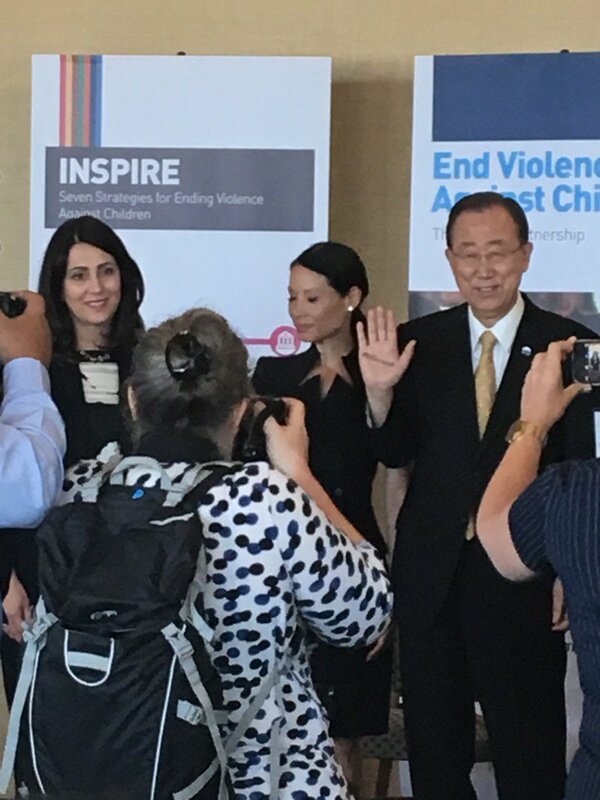 The progress we make together will determine the future of over 1 billion children who suffer violence in their everyday lives; children living in harms way in crisis and conflict zones and children who are victims of sexual abuse and exploitation online. Today I will focus on the latter. I passionately believe that in order to protect children from harm and violence in the 21st century we must act to secure their safety online. Children like Diana and Ramon who spoke so eloquently today those who have joined us here today; are the voices that we must answer. They have the right to be safe online to explore, create, dream and achieve their potential. It’s incredible to see the wonder as they discover the world online; eyes illuminated by the glow of their digital devices. But, parents care givers and teachers can’t always monitor their actions or protect them from those who intend to do harm. Technology empowers everyone equally and tragically, criminals with a sexual interest in children are joining forces with other offenders online to abuse children on a mass scale. Sexual predators can pay to watch the live-streaming of children being sexually abused and children are being coerced into producing sexually explicit images of themselves, after being groomed online by people they have never even met. This MUST stop. We must turn technology against the criminals to eradicate online child abuse, exploitation and violence. That’s why we founded WePROTECT and the UK has been leading this agenda with the support of Prime Minister David Cameron and Home Secretary, Theresa May. In December 2014, we convened the first WePROTECT Summit in London to agree a coordinated multi-stakeholder global response to this horrific crime. We set out the challenge for countries, companies, and civil society organisations to protect children from harm online no matter where they live in the world. The second WePROTECT summit hosted last November by the United Arab Emirates in Abu Dhabi secured an even wider global reach for WePROTECT, bringing the total to 63 for countries signing the global statements of action and the model national response programme and over 30 companies and international organisations supporting the global commitments. Since then we have gone from strength to strength by merging with the Global Alliance against Child Sexual Abuse Online, led by the US Department of Justice and the EU Commission. Today, the newly merged WePROTECT Global Alliance represents a unified global movement to eradicate child sexual abuse and exploitation worldwide. The Internet Watch Foundation (IWF) committed to working with technology companies to share hashes – or digital ‘fingerprints’ – of 19,000 indecent images of children– all of which originated from UK law enforcement’s Child Abuse Image Database (CAID) – which have been assessed and shared with 5 major global technology companies, enabling the removal across all of their platforms and products, and preventing the sharing of illegal sexual abuse images. Our mission is to empower everyone with a responsibility to protect children online with the best tools, technology and support to identify and safeguard victims, remove child sexual abuse material from the Internet and track down perpetrators all over the world. All of this work requires resources to ensure maximum impact. Over the past year, the UK in partnership with UNICEF funded £10 million to programmes, projects and initiatives in 17 countries. This has delivered concrete action: Some recent examples include the rescue of 18 children from sexual exploitation in Madagascar; two exploitation rings were brought down in Guatemala, with 28 offenders investigated and prosecuted; and in Kenya, 2,244 child victims received support through child protection services. And now that we have a growing body of proof of impact, the UK reaffirms our commitment to the Fund of an additional £40 million over the next four years. Young people have a clear sense of the threat they face: 80 per cent of 18 year olds surveyed in a 2016 UNICEF study believe that young people are in danger of being sexually exploited online. That is why UNICEF led the #ReplyForAll communications campaign, to reach children and young people all over the world. The campaign’s heart-breaking but inspiring video stories from the victims of abuse and those who have stood up to end violence online have already been shared and viewed 2.6 million times. And this and other awareness-raising have reached 13 million people in 17 countries. The launch of the Fund to End Violence today will enable us go on preventing and responding to all of the varied and dreadful forms of violence that our children face. With your help, the Fund can support the pathfinders, implement the INSPIRE strategies, ensure that the Partnership can deliver its goals and meet the commitment that we have made in Sustainable Development Goal 16.2: to end abuse, exploitation, trafficking and all forms of violence against and torture of children. No one country, organisation or company can solve these problems alone, it takes us all, united and committed. I believe in my heart that we can beat this challenge and the results we are beginning to deliver demonstrate what is possible when the world comes together. In closing, I would like you to join me to answer the question I posed at the beginning, “when our time is up, will we have done enough? ” Our answer must be YES!